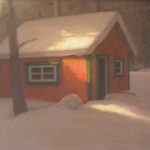 Christopher’s art focuses on two principal areas: cottage country motifs (older boathouses and cottages) and the northern Ontario landscape. 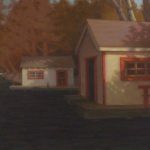 As a youngster in the 1960′s, Christopher spent summers at Balm Beach (Georgian Bay), where each year the family experienced the northern misadventure known as “running a cottage rental business”. Muskoka was sometimes a summer destination as well, as his grandmother had a cottage near Mortimer’s Point. 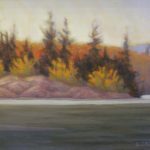 During university, hiking and canoeing trips in Algonquin, Killarney and Lake Superior provincial parks instilled in him a love of the Ontario wilderness and fostered his interest in landscape painting. 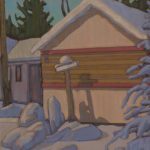 [info_popup pop_title=’Gerry Lantaigne: Biography’ message=’Christopher’s art focuses on two principal areas: cottage country motifs (older boathouses and cottages) and the northern Ontario landscape. 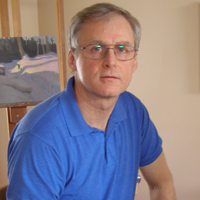 As a youngster in the 1960′s, Christopher spent summers at Balm Beach (Georgian Bay), where each year the family experienced the northern misadventure known as “running a cottage rental business”. Muskoka was sometimes a summer destination as well, as his grandmother had a cottage near Mortimer’s Point. 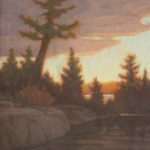 During university, hiking and canoeing trips in Algonquin, Killarney and Lake Superior provincial parks instilled in him a love of the Ontario wilderness and fostered his interest in landscape painting. 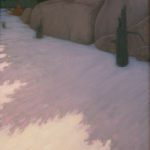 In the late 70′s Christopher completed various credit courses at the (then) Ontario College of Art (and in the 80′s and 90′s would later attend The Okanagan Summer School of the Arts and do painting and colour workshops through the Emily Carr Institute of Art and Design). In 1980 the Crosgreys left Ontario for northern B.C. to pursue careers as secondary school teachers, landing in the Skeena Valley (i.e. the totem pole country painted by Edwin Holgate, A. Y. Jackson and Emily Carr). 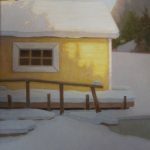 Here Christopher studied extensively with landscape painter David Nehring and credits this instruction, at times received while painting on location, as being vital to his artistic development. In 1994, while teaching in Hope, BC, Christopher took a one-year sabbatical. He came east and, for future reference material, photographed extensively the older cottages and boathouses, many of which have since vanished. 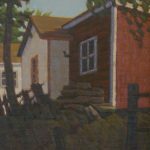 The remainder of his sabbatical was devoted to working steadily on his own oil painting. 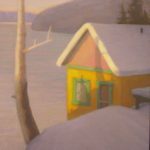 This led to membership in The Federation Of Canadian Artists and Christopher having work accepted into several juried shows at The Federation Gallery (Vancouver), receiving an Honourable Mention in The FCA’s “Annual Winter Juried Exhibit” in 1997. 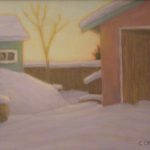 Through exposure from FCA exhibits in the ‘90’s, Christopher began selling work in Ontario through Toronto’s Arcadia Gallery. While there, he participated in group exhibits and eventually staged a successful two-man show with Paul Mantrop.